SPECIALIST SPOTLIGHT: Steve’s Passion for Improving People’s Lives Every day! Steve undeniably accredits his long-term success and his favorite part of working at Lucid Hearing to the support from his Direct Managers (DM), General Managers (GM), and the entire support staff at corporate headquarters. Over the past 4 years, Steve has had many many memorable experiences with providing hearing assistance and helping numerous people Hear Better. He shared a few of these experiences with us. “The family of the gentleman I helped hear better from this last spring just before Easter came in as a whole [family] at his one-week checkup super thrilled because “We got our Dad back!” Super cool to say the least! Helping people, comforting people in need and striving to utilize the best strategies for optimal health is normal practice for Steve. Steve believes Lucid’s unique product line and approach addresses hearing assistance and augmentation in a unique and compelling way. Lucid’s revolutionary technology and commitment to providing first-time users to experienced users quality service. From the initial screening to one’s unique fitting needs, through our continued service proves Lucid Hearing’s “dedication to making sure each and every patient receives the value they deserve.” Steve is humbled by the value and assistance he brings to his patients. Equally, he notes, “it is reciprocal.” His patients bring joy and an ultimate sense of fulfillment to his life. Steve has noticed hearing assistance and hearing aids change the impaired and their families’ lives for the better. One of the many joy’s of his job is watching the profound change that takes place from start-to-finish from life before being tested to receiving the benefits of wearing our products! Often, Steve explains, “one of the biggest surprises is when they realize they have a loss and it isn’t because other people are mumbling.” He goes on to describe once they experience a product demonstration they quickly hear and are able to fully understand what and how much they have been missing out on and exactly how their life can be improved! When Steve is not helping his patients hear better, he enjoys spending time in the garden learning and eating healthy. We are lucky to have Steve’s expertise, loyalty, and his dedication on our team! Megan E. has only been working at Lucid Hearing for a couple of months, but she is already embodying the Lucid Hearing spirit! Megan is a Hearing Instrument Specialist. Curious about what a Hearing Instrument Specialist does? A Hearing Instrument Specialist selects and fits hearing aids for customers. In addition, hearing instrument specialists administer and interpret hearing tests and measure the effectiveness of hearing instruments. Some of their job includes: preparing, designing, and modifying ear molds for the purpose of hearing aids. This job takes talent, skills, patience, and a kind demeanor, all of which Megan demonstrates every day. There’s one main thing that inspires Megan to look forward to coming into work each day: “The opportunity to help someone hear better, each and every day, because the sounds of life are so sweet to hear.” Megan appreciates the sounds in the world, from the softest to the louder sounds, and she shares this appreciation with those who she tests and fits for hearing aids. Her favorite part of working at Lucid Hearing in her short time with us has been the “amazing products and VALUE!” According to Megan, Lucid is an amazing company to work for because of the environment of teamwork. Everyone supports each other and everyone is valued for their work. My PASSION is what drives me. I LOVE animals, reading, and recycling. I’m so, so, so THANKFUL for those that have helped me carve y path in the hearing profession. Megan offers so much to our team at Lucid Hearing and we are glad to have her on board! Manuel V. has been a Lucid Hearing Specialist for approximately 1 year now and he has been making an incredible impact on the people he fits with hearing aids. We took some time to learn more about Manuel’s perspective on hearing loss, and his experiences with Lucid Hearing. We came away feeling inspired by his commitment to the field of hearing technology and are excited to share what we learned with you! Manuel first became interested in becoming a hearing specialist because his own father had hearing loss. Manuel remembers seeing the frustration, discomfort, and embarrassment that came with his father’s hearing loss. Now, Manuel envisions every patient that sits in his booth as his father. By envisioning every patient as his father, Manuel is able to sympathize with the patient at a deep level. This sympathy drives Manuel to help every patient to the best of his ability. Every day, Manuel assists about 7 to 10 people. That’s between 1, 827 and 2, 610 visits a year! Manuel stays busy at work, but still gives every person who walks through the door his undivided attention. Manuel’s favorite part about working for Lucid Hearing is that as a salaried employee, he can focus on helping people hear better, as opposed to trying to sell a product. Every day, he comes to work hoping that he can help someone hear better, regardless of whether they purchase a product or not. In this way, his job is educational and people-centered. He believes this is what keeps him grounded and keeps him excited to come to work every day. Manuel’s steadfast dedication to helping people hear better is so appreciated and admired! We feel grateful to have him on our team! Michelle has been a valued specialist at Lucid Hearing for 3 years now and still looks forward to coming into work to share smiles with members and build lasting relationships. She originally decided to become a Hearing Specialist because she is a “people person.” She loves giving and helping others. In addition, she loves music, and she couldn’t imagine her life (or anyone else’s) without communication or the sounds of life. As she told us, “this career was a perfect fit!” Before working as a Hearing Specialist, Michelle was an Artist/ Muralist for 15 years! Michelle has a BBA in Marketing and has three kids who are her inspiration and motivation. She thrives off of creativity, nature, and knowledge. Over the past 3 years, Michelle has had many many memorable experiences with providing hearing assistance and helping people Hear Better. She shared a few of these experiences and insights with us. Michelle is a passionate person who truly cares for others. Along with providing hearing assistance every day at work, Michelle likes to help out wherever she can in community outreach programs. She has helped with her local community in many ways, financially, emotionally, and spiritually. Michelle has helped in children’s shelters, has helped prepare care packages for the homeless and deployed, has physically helped rebuild and repair homes for the needy, and has collected shoes and school supplies to those in need. She also loves to run in a lot of 5Ks that are raising money for various benefits! Getting to learn new things and meet new people are some of Michelle’s favorite things! She is always trying to learn and self improve, physically, mentally, spiritually and emotionally. We are lucky to have Michelle’s passion, warmth, curiosity, and dedication on our team! Joy B., one of our wonderful Hearing Instrument Specialists, truly understands what her patients are going through when they are getting accustomed to their hearing aids. Joy is an empathetic, talented Hearing Instrument Specialist on our team! Joy is an amputee and has had 18 surgeries. She understands that adapting to changes is a process. She also understands the importance of supporting each other through the process of adaptation–regardless of how big or small the challenge is. Every day, Joy brings her deep empathy (along with her incredible talent) with her to work with Lucid Hearing. Joy has worked with a lot of different products, but she says she enjoys Lucid’s product line more than any other! What sets Lucid’s products apart? Joy cites the free aftercare services, the free software updates, and the clarity of the products. According to Joy, her favorite part of working at Lucid Hearing is: working with an amazing product with superior sound! We are lucky to have Joy on our team as a Hearing Instrument Specialist! The talent and passion she brings is so valuable! 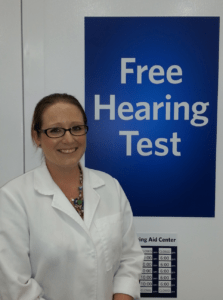 Joy works at our hearing center in Temple, TX. Come by to say “hi” if you’re ever in the area! Liz K. is a Hearing Instrument Specialist at Lucid Hearing. She’s been working at Lucid for 5 years, but she’s been immersed in the hearing aid industry for her whole life. Liz’s mother, older brother, sister AND husband all work in the hearing industry. Though her mother is retired, her mother’s heart still melts when she hears about her family’s work continuing the family legacy in the hearing industry. Liz comes from a family legacy of helping people hear! She’s keeping the legacy alive by helping up to 10 members hear every single day! Liz took the time to talk to us about her work as a Hearing Instrument Specialist at Lucid Hearing, and we felt SO inspired by her stories and passion. Liz fell in with the hearing aid industry while she was working as her mother-in-law’s Office Manager at her hearing aid company. Every day at work is exciting for Liz. In her words: “I enjoy coming into my office knowing I have a booked day of tests and just having that ‘feeling’ of KNOWING I’m going to help someone improve the quality of their life.” Liz helps up to 10 people per day! However, she notes, some people delay coming in to Lucid Hearing because they don’t even realize they have a hearing loss.